The new Park MGM takes over for the former Monte Carlo Resort & Casino. The Golden Knights have captured fans’ hearts in Las Vegas. Opening Day for the 2018 regular season of the National Hockey League is October 3. Why the puck should you care? 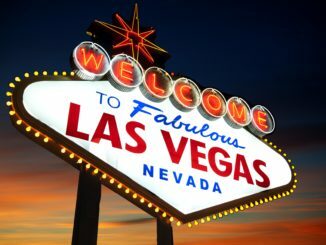 If you’re planning a trip to Las Vegas after that date know that Sin City now has a professional hockey team. In fact, against all odds, in its 2017-18 inaugural season the Golden Knights went all the way to the finals before losing the Stanley Cup to the Washington Capitals. Everybody loves a winner, and hockey in Vegas is now kind of a big deal. My eyes were opened to this last April. After picking me up at the airport my driver alerted me to the possibility of heavy traffic near The Strip. “What else is new,” I thought to myself. He mumbled something about a hockey playoff game causing backups. 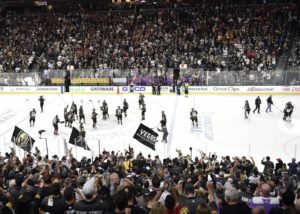 It happened to be the evening of the first playoff game of the Golden Knights’ first-round series against the Los Angeles Kings. The Knights won a 1-0 thriller, then came back two nights later and went into double overtime to beat the Kings, 2-1. These games were enthralling the locals. To be honest, I’d been barely aware of the existence of hockey in the desert. But since then, I’ve unabashedly climbed aboard the Golden Knights bandwagon. 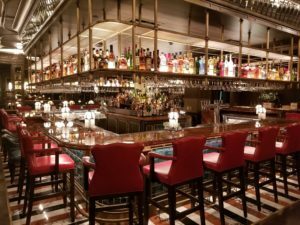 Bavette’s Steakhouse & Bar in Park MGM. 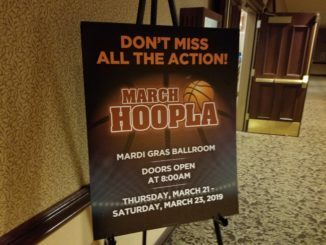 While the Knights were claiming hearts in the city at the start of last year’s postseason run, my hotel destination was Park MGM, previously known as the Monte Carlo Resort & Casino. The hotel (originally opened in 1996) has been re-imagined and renovated to the tune of $500 million dollars. For starters, the lobby is filled with self-check-in kiosks–and they really work. You can avoid grueling Vegas front desk lines by using these kiosks, which produce your plastic room key. There are numerous other updates to the hotel infrastructure: Day beds and cabanas to lounge around in at a refined new pool. A new salon and spa. Looking to rock and roll and practice your Poker Face at the same time? Starting in December, Lady GaGa takes over as the in-house entertainer at the 5,200-seat Park Theater. There’s currently no poker room in the hotel. 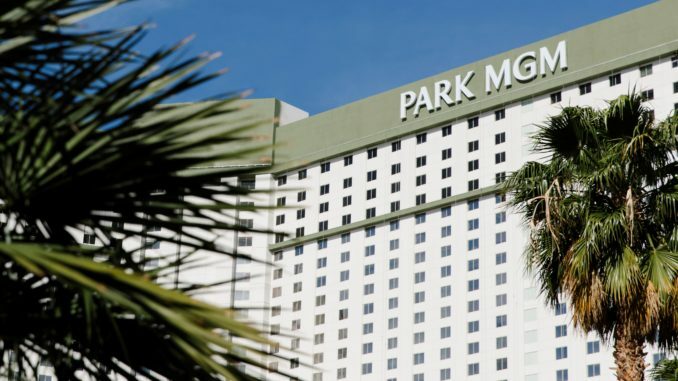 However, Park MGM is connected to the Aria Resort & Casino by an enclosed walkway–so one of the city’s top poker rooms is a short stroll away. One of the best new restaurant in Park MGM is the elegantly gilded Bavette’s Steakhouse & Bar. It’s stocked with red leather banquettes and extravagant chandeliers—with live jazz enlivening the evening scene. Even if you’re just in the mood for a drink, step toward the back of Bavette’s and into the dimly lit speakeasy. Pull up a cozy chair or plop into a couch and order a Bombay Sapphire martini (with blue-cheese-stuffed olives, of course). 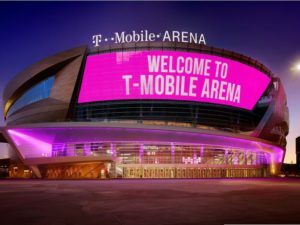 A major benefit to the location of the caterpillar-to-butterfly Park MGM is back-door, walking proximity to the T-Mobile Arena. Avoid taxi lines and ride-share waits and walk right across the street. Built in 2016 for $375 million, the arena offers 17,500 seats for a hockey game, or can be reconfigured slightly larger for touring acts like Justin Timberlake. Yes, I caught JT on his “Man of the Woods” tour. Can’t stop the feeling: Like they Golden Knights in their playoff games, Timberlake had fans on their feet cheering in the T-Mobile Arena. A smart outdoor addition to this energized area is the Toshiba Plaza at The Park. It’s a paved spot where fans who can’t get a Golden Knights ticket can hang out and play games (air hockey, corn hole, Giant Jenga and the like). There are a multitude of casual restaurants in the vicinity (including every eatery connected to nearby New York New York Hotel & Casino). A best bet if you’re pre-gaming: Beerhaus. It’s a modern beer hall for craft beer and casual suds fans, and is a prime spot for people watching.